Butler’s Michael Kreil puts up a shot versus Greenville on Friday night. Butler’s Bryant Johnson puts up a shot versus Greenville on Friday night. The Butler Aviators at Sidney basketball game on Tuesday, Feb. 12 is expected to sell out. Butler High School has a limited number of pre-sale tickets available on a first-come, first served basis. Tickets are $6 for adults and $4 for students. Tickets are available in the Athletic Office. For more information, see Connie Korber or Jordan Shumaker in the Athletic Office or call 415-6384. 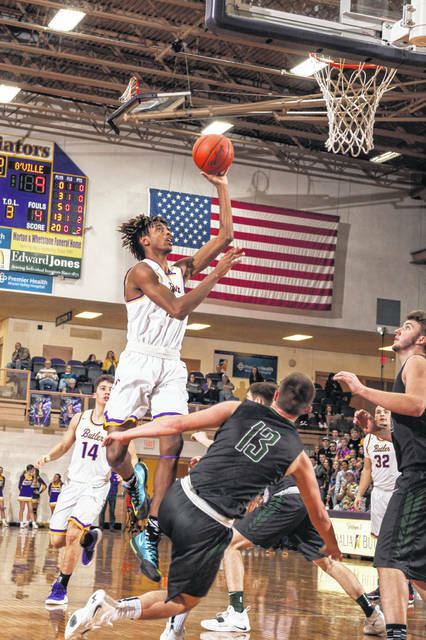 VANDALIA — There are some games that are more about you than your opponent, and with the struggling Green Wave of Greenville coming to town on Friday night, the Butler Aviators found themselves in just such a game. 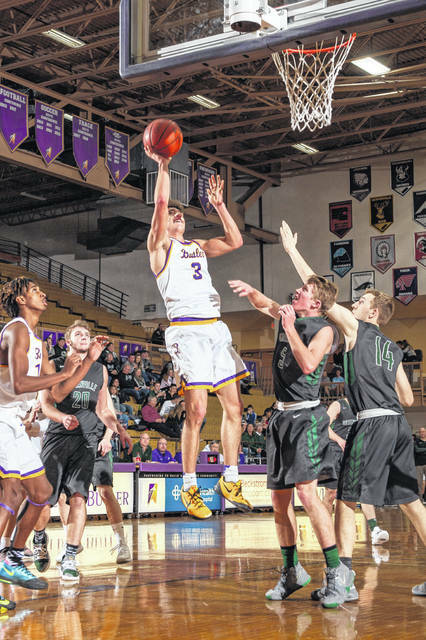 Despite a couple days off due to frigid weather, the Aviators left little doubt as they blistered the nets making 24-of-29 shots in the first half en route to a 85-47 win. The Aviators improved to 16-2 overall and kept pace with Sidney at 10-2 in the Greater Western Ohio Conference North division race. Greenville remained winless at 0-16 on the season and 0-12 in conference play. Butler made sure this game was over almost before it started. Bryant Johnson scored six of the Aviators’ first 12 points as Butler jumped out to a 14-2 lead. Despite a pair of timeouts, Greenville couldn’t get out of their own way as the Aviators forced 13 turnovers and took a 31-7 lead after the opening period. Six different Aviators scored in the opening frame led led by 8 from Michael Kreill and 6 from Johnson. Nothing changed in the second period as the Aviators opened on an 11-0 run. Ultimately, Butler would shoot 83% from the field while forcing 24 turnovers to take an overwhelming lead of 54-16. Butler would eventually lead by as many as 50 at 74-24 late in the third quarter before bench players of both teams finished the game and set the final score. In all, 9 different Aviators scored in the contest led by Kreill’s 18 points, Johnson with 12, and Quentin Glover with 10. Butler will host Versailles on Tuesday before traveling to Troy on Friday evening. Both games are set to tip at 7:30 p.m.